I just love that something meant to stifle and inhibit, does the exact opposite and brings a community of book lovers together. Is there anything better than renegade librarians? I won't go into a elegant lecture about the injustice of censorship because the fact that you are reading my blog (and probably others) says enough. This is freedom of speech at its best. We all have the freedom to publish our thoughts, experiences and beliefs on the internet for all to read, and unless the words are not our own, no one has the right to stop us. That's a pretty powerful thing if you think about it. The 100 Most Challenged Titles from 2000-2009. Oh, look at what #1 is. Salman Rushdie had a death sentence (fatwa) placed on his head from the Ayatollah Khomeini of Iran and had to go into hiding for years because his novel, The Satanic Verses, was considered sacrilegious. I have always been fascinated by him, and I dream of meeting him one day. Also he frequents as a guest on The Late Late Show with Craig Ferguson, so he must be cool. I mentioned this company yesterday, but I just have to share again because they are too great. They are the Toms for books. Top 10 Far-fetched Reasons that Books have been Challenged. Anne Frank...because it was "a real downer" requested by professionals from a textbook committee! Fifty Shades of Censorship. Because you had to know this book would come up. There is really so much out there on this topic, and I find it all incredibly fascinating. I do believe people have the right to complain about what's in a book as much as the author had the right to write it. I just cannot justify excluding everyone else from the ability to read it. The discussion of school curriculum and libraries is obviously a touchy one. As a mother, I can understand both sides of the issue. There are certainly some (mostly extreme) materials I don't want my son to be reading, but I get heated at the idea of some other parents banning an important piece of literature because it doesn't align with their personal beliefs. So, I'd love to hear your thoughts on this topic! Where do you stand on this issue? Do parents and community members have the right to dictate what's in a school's library and/or curriculum? Let me start by saying, my most searched keywords that lead to my blog are "Literary Costume Ideas". I did one last year, so you know I have to do it again! And I want your input too. You can share ideas, photos, tutorials, whatever! I think this one will be a lot of fun. :) Literary Costume Ideas....go! I am loving the book tees. I need to go order some! They would look great layered over a long sleeve shirt. I can't believe how many book are on that list. I really think anytime you tell someone they can't do something it just makes them more likely to go do it. Exactly. I just think some people can't see past their own life to see that what's right for them, isn't right for everyone. 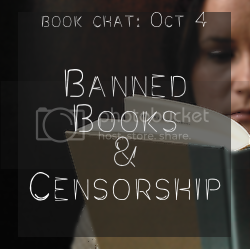 Thanks for linking up with the book chat! Ugh I didn't have time to participate this week. However I LOVE that book-to-shirt company OMG!! Also I've heard so much about that Salman Rushdie book. I'm quite curious to read it! I want to read that book too. I've read another one by him and it was very strange and a little hard to get into, but I still find him so fascinating! 2. Lots of parents were against it, against kids reading it, wanted it banned, etc. I thought to myself...WOW, whatever this is it must be great to get those two reactions. I had to wait until after graduation to see what it was all about. Of course, I loved the books. But, even if I had hated them or if they had somehow offended me there's no way I would ever suggest they be banned (well, okay, maybe if they advocated doing harm to others but that's probably the only reason). I will never understand those who feel it is their right to impose their beliefs onto others. Such a great point. I think HP did great things for young readers. And I agree with your last point...I will never understand ignorant people. Very cool topic! I wish I would of been able to play along this week, but, ya know, I 'm a slacker like that. Sorry. 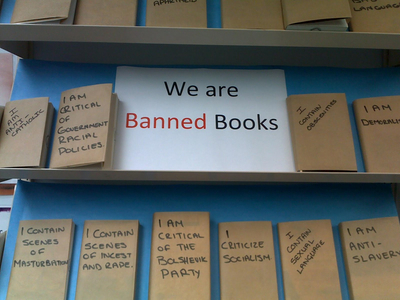 I totally missed this :( But I do have to say how insane it is that in this century there are still books being banned! And a lot of those books have been banned from various libraries for decades or in the case of The Adventures of Huckleberry Finn, HUNDREDS of years. It just totally boggles me. Sometimes I wonder how society can be so forward and backward all at the same time. What a strange world we live in! No worries about missing this week :) Next week! Yes! about society being forward & backward. I wonder that all the time! I think there is just a big chunk of this country that is holding the rest of us back, but for the most part, I think we are becoming very progressive...especially this generation.